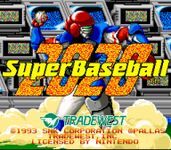 Super Baseball 2020 is a futuristic baseball video game. It was first released in Japan for the Neo Geo in 1991, and then it was later released in North America for the Mega Drive/Genesis (ported by NuFX and released by Electronic Arts) and Super Nintendo Entertainment System (released by Tradewest) in 1993. The game follows the basic rules of baseball, but there are several upgrades since the game takes place in the year 2020. The most obvious difference from real baseball is that some of the characters in this game are robots. All the human characters are equipped with powerful armor, computer sensors, and jet-packs for improved offense and defensive skills. Different from real baseball and other baseball video games, this game consists of both male and female characters, as well as robots. All three types of players have the same basic abilities and vary only on their personal strengths. In many cases, human players are better than their robot counterparts. One major difference between the human and robot characters is that the robot characters can blow up (or lose all their power) if they are worked too hard during a game. That can happen if you constantly make them dive for a ball, run extra bases, or even if they get hit by a pitch. Source: Wikipedia, Super Baseball 2020 , available under the CC-BY-SA License.